Photo by Andres Urena on Unsplash. In mid October, three prominent researchers of wearable and embodied technologies––Drs. Nicole Caswell (East Carolina University), Ann Hill Duin (University of Minnesota), and Michelle Eble (East Carolina University)––participated in a virtual roundtable hosted by DRC Graduate Fellows Jason Tham and Lauren Garskie to discuss digital rhetoric in the context of immersive technological experience. The roundtable began with Caswell, Duin, and Eble each sharing what wearable technologies meant to them. In defining wearable technologies, Eble explained them as on or in the body, which can lead to a quantified self. Caswell expanded on this by defining them as not only measuring, but mediating. Both Eble and Caswell observed how they are often to help people, seen as a means of being a better person. Duin noted the connection of wearable to phones and often it has an app that goes with them. In expanding on their definitions, their own projects, and the impact of wearables on rhetoric and technology studies, themes emerged that include embodiment, affective computing, and collaboration. 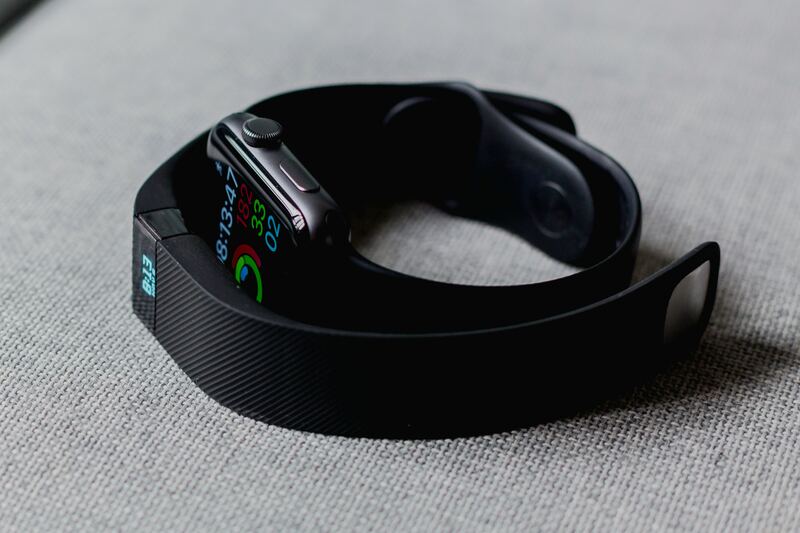 Eble began by discussing the design of wearable technology, pointing out the obvious marketing tactics employed by wearable technology companies that created a gender binary in the market segment. Eble observed that specific wearable devices are marketed to females and other to male users. A research collaborative at East Carolina University is devoted to studying such gender-fication of technology market segmentation from a rhetorical standpoint. The focus on gender often leads to questions of identity. Duin shared that scholars across multiple disciplines at the University of Minnesota have also formed a multidisciplinary collaborative workshop to identify ways in which wearables and other embodied technologies technologize the human body and identity. The ways we wear these technologies, and are worn(out) by them, call for new scholarship to investigate the intersections of rhetoric, computer science, and more importantly, the embodied experience of users. For these reasons, Duin, Caswell, and Eble agreed that digital rhetoric is continually challenged to expand its concerns beyond the screen. One thing that excites Duin is the potential of wearable and embodied technologies in invigorating and overall impacting collaboration. Duin shared that what got her started on the journey of wearables research was the pioneering technology of smart glasses as wearable computers. She envisioned that wearable technologies would reimagine the way we capture, use, and share ideas. Caswell and Eble agreed that wearable computers have the capacity to reframe technical communication practices, and the three scholars urged digital rhetoricians to open investigation on audience in the age of immersive experience. What does it mean to communicate ideas at a time when the audience could be submersed into a simulation affecting their multiple sensories? We invite you to further listen to Caswell, Duin, and Eble’s discussion of how we might theorize wearable technologies as new literacy and what they see as the future of wearable technologies with regards to writing and digital rhetoric. The three main themes emphasized here capture the main points discussed in the 30-minute virtual roundtable with Caswell, Duin, and Eble. While they reveal many complications with wearable and embodied technologies, there are other ideas that were mentioned in passing: productivity, design, culture, philosophy of technology, and interdisciplinarity. We hope to continue this conversation by means of online comments and a potential blog carnival in Spring 2018. Lauren Garskie is a PhD student in the Rhetoric & Writing Program at Bowling Green State University. Her interests include design, literacies, digital rhetoric, and multimodality.